SINGAPORE (ICIS)--Singapore’s petrochemical exports in August rose by 3.4% year on year to Singapore dollar (S$) 1.58bn ($1.2bn), official data showed on Monday. By volume, exports of paraxylene (PX) rose by 1.9% year on year to 142,202 tonnes in August, while naphtha shipments declined 6.6%. 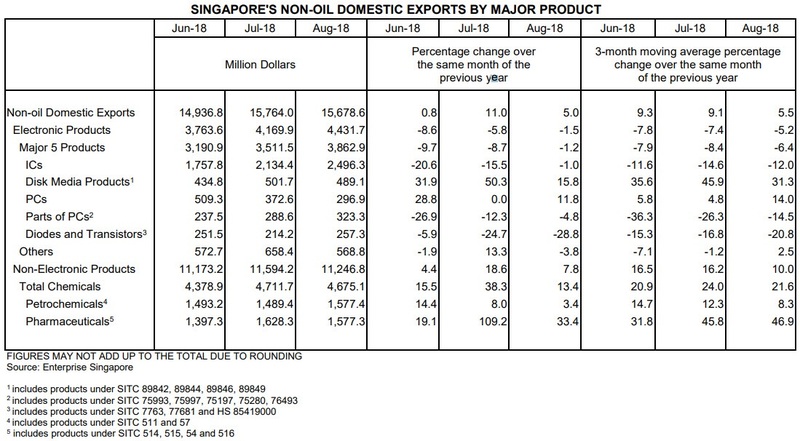 Singapore's overall non-oil domestic exports (NODX) in August rose by 5.0% year on year to S$15.7bn, representing a slowdown from the 11.0% expansion recorded in July, Enterprise Singapore said in a statement. Non-electronic NODX, which includes petrochemicals and pharmaceuticals, rose by 7.8% year on year to S$11.2bn in August, weaker than the 18.6% growth posted in July 2018. Non-electronic NODX exports to the US rose by 31.2% year on year in August, while those to the EU increased by 14.9%. Singapore’s non-electronic NODX exports to China fell by 15.2% year on year in August.